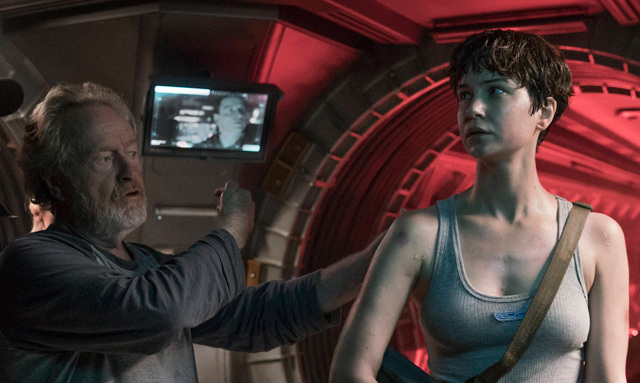 The photos from 20th Century Fox‘s Alien: Covenant continue to burst out daily and today we have another look at Katherine Waterston’s Daniels with director Ridley Scott (via Empire). This follows the new photo from this morning which featured Michael Fassbender’s Walter, a new android in the film. You can view both photos in the gallery below. “Unlike Sigourney in ‘Alien,’ [Daniels] is in a survival mode of sorts from the beginning. She’s not the captain, but she’s a natural leader so in times of crisis she falls into that position quite easily,” Waterston tells the magazine. Michael Fassbender stars in the film along with Katherine Waterston (Inherent Vice), Danny McBride (Eastbound & Down), Demián Bichir (The Hateful Eight), Jussie Smolett (Empire), Amy Seimetz (Upstream Color), Carmen Ejogo (Selma), Callie Hernandez (Machete Kills), and Billy Crudup (Watchmen). Noomi Rapace is also expected to reprise her role as Dr. Elizabeth Shaw, and James Franco is said to play the Captain of the title ship. Jack Paglen (Transcendence) and Michael Green (Green Lantern) are providing the Alien: Covenant screenplay, which Ridley Scott once again directs. Alien: Covenant will open in theaters on May 19, 2017.